IOTA executes a transaction between machines that rely on the Internet of Things. It is a distributed ledger technology that uses a decentralized acyclic graph or DAG instead of blockchain that most other cryptocurrencies use. It is aimed to be the standard mode of the transaction between internet-connected devices in the future. It can enable micropayment transactions between connected devices. IOTA is currently traded at USD 0.347592 (UTC time 05:56). With a market cap of USD 966,141,586 and a circulating supply of 2,779,530,283 MIOTA, it is the 15th largest cryptocurrency in the world. The above chart shows that IOTA is currently traded at 0.347162 USD or 0.00006680 BTC (UTC time). 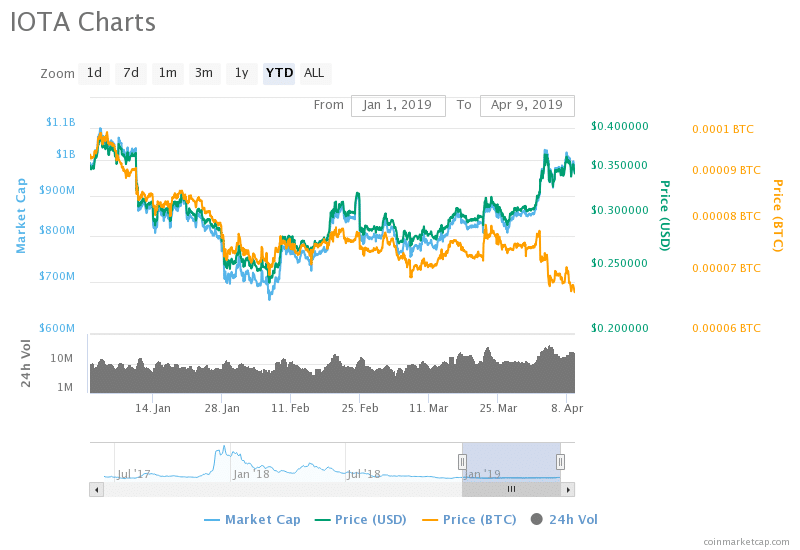 Its current market cap is worth of 964,948,472 USD with a 24h volume of 22,819,889 USD. The same chart shows that approx. One month earlier, IOTA had a trading value of 0.304299 USD. So, within this period, the value of IOTA has been raised by 14.08% with 0.321724 USD as a good support resistance. The technology behind IOTA is “Tangle” which helps boosting efficiency and also streamlines the interaction of the stakeholders. It partnered with Volkswagen, Renault, and BMW. So, the developers of IOTA are pretty excited about the updates that they are going to launch this year. Investors also have high expectations from IOTA in the upcoming years. Accordingly, Mega Crypto price thinks that IOTA can trade around $1.13 by 2019 end. This is indeed a pessimistic observation. Long Forecast assumed that IOTA could be devalued in 2020 and it can be around $0.60 then. Smartereum believes that IOTA can touch $38 by 2023 which we think is quite optimistic from the perspective of the progress mode that IOTA is following currently. According to trading beasts, IOTA can be valued at $7.06 to a maximum of $10.38 by 2020. IOTA has also partnered with MOBI to enable better security to the trading of the cryptocurrency. It has a lot of potentials for the future and keeping that in mind; we think that IOTA can reach at $4.28 by the end of this year. Currently, IOTA’s price is fluctuating due to intense, volatile conditions of the market but, it is susceptible to rise once the market condition improves.